GoldieBlox designers spent a year researching what works for girls – they spoke to Harvard neuroscientists and they observe the differences in play patterns between boys and girls – to ensure the ability of their product to engage girls in the way that they envisage. Why are toys like GoldieBlox so important? Despite the efforts to draw more women to these professions, careers in engineering remain heavily male-dominated. The belief is that there exists cultural and social barriers that are inadequately addressed. It is evident that girls as young as 8 years old are losing interest in math and science and it is not hard to see why. In a typical toy store, the boys are encouraged to play with construction toys and chemistry sets, while the girls are directed towards princesses and dolls. If we can get the girls interested in math and science from an early age, it increases their likelihood of going into those fields as adults so isn’t it time we made our girls aware of the full range of career options available to them? What’s in GoldieBlock and the Spinning Machine? 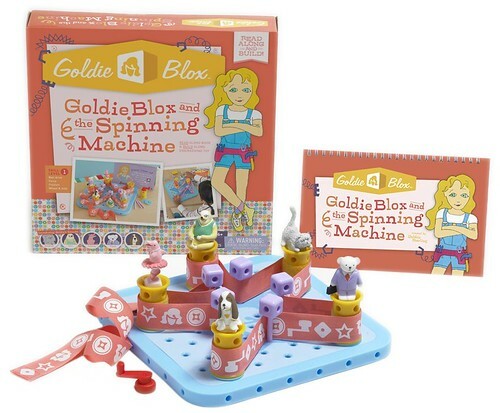 Read the inspiring story behind the development of Goldie Blox.